Chris works with teams of marketing, branding and technology professionals to improve a companies interactive marketing, online sales, and clicks to bricks approach. He has had the pleasure of working with the digital teams at enterprise companies including Allstate Insurance, 3M, Toys R Us, Tyco, Zurich Financial, Avis Budget Group, Zipcar, CitiGroup, The New York Times and The American Red Cross. Chris leads a team of talented veteran digital marketers who do everything from crafting original research, to developing omni-channel digital marketing strategies, to deploying data-fueled programmatic media. His team builds solutions and deep consumer insight to help companies better engage the mobile, local & social consumer of the future. With this team, they are responsible for growing and maintaining our Enterprise Media and Research business across North America. Chris is a contributor to the book The BuyerSphere Project – How Business Buys From Business in a Digital Marketplace and also a speaker with the Google Engage Project, The Conversion Conference, Bing Ads Connect, DX3, SMX East, Store Canada, The Digital Strategy Conference and a guest lecturer at the University of British Columbia and Okanagan School of Business. My shift into the field of marketing came from a sales & operations angle. I was an aspiring golf professional, who was working at a club in the summer and playing golf in the winter at university. After university, and the realization I was not Tiger Woods, I started working with a large sporting goods distribution company and we were in the process of transitioning our business to be more digital in order to improve the sales, ordering and fulfillment chain. As part of this process, I became more interested in how sales and marketing were becoming more closely integrated. I also realized a digital consumer was becoming more in control of the educational process when looking for products – being less influenced by traditional sales & product knowledge. This curiosity made me interested in digital media and the role it was playing in changing a sales persons role and influencing customer experience. This interest led me to cross paths with a digital marketing and research company called Enquiro. In 2006, I volunteered for a study they were conducting on how people interacted with a Google search results page. I was an eye-tracking lab participant in a 60 minute research session. I loved it, and I came out of that session with more questions about digital marketing, so I asked ‘who runs this company’. After several meetings, I started working for Enquiro, a leading search marketing company. Ten years later I have found many of the answers I was seeking that spurred my original passion. Today, I have a whole new batch of questions to find answers to. As the digital media landscape evolves, I look at it less as channels and more as audiences. It’s not about trying to find the right channel or site your customer will be on, it’s about trying to pull your ideal customer out of the crowd and intersect them at the right moment. I find the most valuable source for leads is in leveraging the right type of consumer data to find the right consumer, with the right intent, at the right moment. This sounds easier than it is, but its extremely effective. The chase today is how to best engage the social, mobile and local customer and cut through the clutter by matching intent with valuable content and influence an action. Today a DMP (Data Management Platform) is one of the most critical elements to being an effective marketer. Segmenting and understanding your audience in real-time is a necessity today. This information paired with your performance analytics and lead management platform enable much smarter actions to be taken. This insight builds stronger strategic roadmaps, and drives better sequencing of campaigns and messaging to drive better outcomes. I always see economic trends having the largest impact on marketing efforts. Economic pressures create challenges and also great opportunities for marketers. The measurability of digital media creates confidence for investment and it also creates pressure on less measurable forms, which helps digital media gain more share. But as this shift increases, it requires digital media to expand its reach and also prove value much higher up the funnel. We see this happening more in 2017. With advances in data management and attribution, we will be better positioned to prove value at the awareness and research phases of the funnel, across various channels, that will stimulate more efficient conversions in the end. This is easy. Be curious and challenge the status quo. What you have learned, or are learning today, could be obsolete in 18 months. Many people like to hold on to what they understand because its comfortable. As a ‘rookie’ in the space, don’t become complacent with knowledge. Become comfortable with change and uncertainty. Ask questions, challenge thinking, and read a lot. Also, seek out mentors that help you keep this perspective. The kind of people who always have a different view of things, people who have a passion in figuring things out and always seek to find a better way – that will keep your tank full. 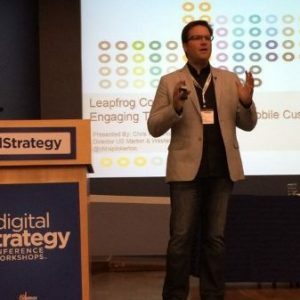 Chris is a digital marketing and customer experience thought leader. He is a fantastic speaker and worth connecting with on LinkedIn. Over the past decade, his company has been producing public research on the evolving digital consumer. Including their latest research on how mobile habits are changing consumer behavior.